In LESSON 16 we showed a simple Client Server model that allows us to send strings between Python running on a PC and the arduino over Ethernet. That lesson simply passed strings back and forth to show a very basic Server on Arduino, and Python acting as the Client. 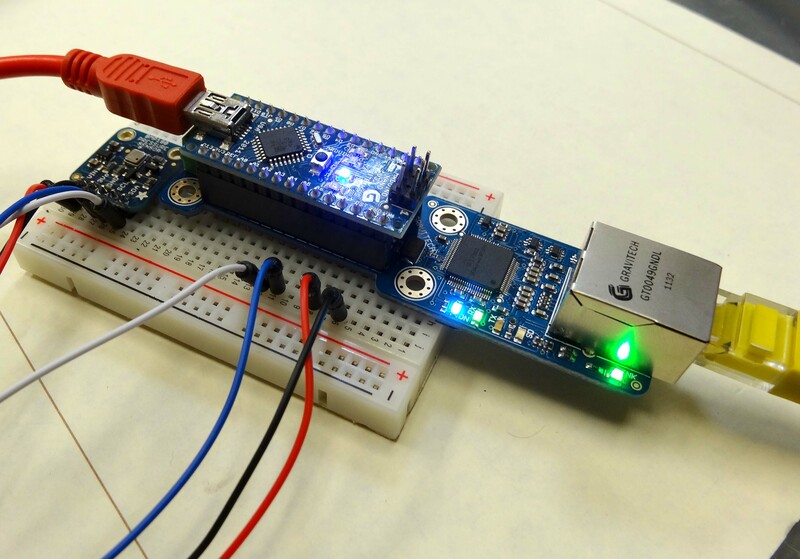 In this lesson we show a more practical example, with the Arduino connected to an Adafruit BMP180 Pressure Sensor. In order to complete this lesson, you will need an Arduino, an Ethernet Shield, and the Pressure Sensor. If you do not have this particular pressure sensor, you can probably follow along in the lesson using whatever sensor you have that is of interest. The video will take you through the tutorial step-by-step, and then the code we developed is shown below. The key issue in getting this project to work is to get your mac address and IP address from your router or network. If you are at school, simply speak to your network administrator, and he will help you get an IP address for your arduino. If you are at home, you will need to connect to your router from a browser, and configure it to assign an IP address and agree on a mac address for your arduino. Some arduino Ethernet shields have a sticker with a mac address. If your Ethernet shield has a sticker with mac address, use that one. If it does not, you will need to come up with a unique mac address. There are thousands of possible routers and networks out there, so I can not help you with that part. But if you look in the router documentation, you should be able to get the IP address and mac address worked out. The arduino itself does not have a hard wired mac address, but you set the mac address in the arduino software, and the IP address as well. The key thing is that the mac address is unique on your network, and the router and arduino agree on the IP address and mac address. If you have a clearer way to explain this, please leave a comment below. This is the server side software to run on the arduino. Again, you should use a suitable IP address and mac address for your network. Do not think you can just copy the ones I use in the code below. Once you have this on your arduino, and the arduino connected to the internet via an Ethernet cable, you can test by opening a command line in Windows. Then ping the address you have assigned to the Arduino. If it pings correctly and you get a reply, you are ready to develop the Python code. The Python will be the client. 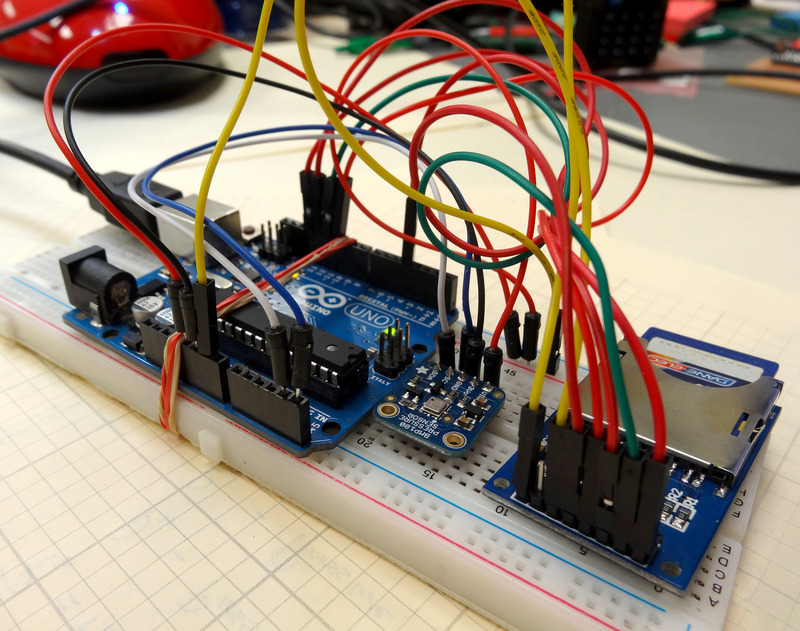 It will send the requests to the Arduino, and the Arduino will respond with data. Since our circuit can measure pressure or temperature, you can request either of those. When the arduino receives a request for temperature, it will go out, make the temperature measurement and then return the data to Python. Similarly, if you request Pressure the arduino will read the request, will make the Pressure measurement, and then return pressure reading to the client (Python). from socket import * import time address= ( '10.1.15.243', 5000) #define server IP and port client_socket =socket(AF_INET, SOCK_DGRAM) #Set up the Socket client_socket.settimeout(1) #Only wait 1 second for a response while(1): data = "Temperature" #Set data request to Temperature client_socket.sendto( data, address) #Send the data request try: rec_data, addr = client_socket.recvfrom(2048) #Read response from arduino temp = float(rec_data) #Convert string rec_data to float temp print "The Measured Temperature is ", temp, " degrees F." # Print the result except: pass time.sleep(2) #delay before sending next command data = "Pressure" #Set data request to Pressure client_socket.sendto( data, address) #Send the data request try: rec_data, addr = client_socket.recvfrom(2048) #Read response from arduino Pressure = float(rec_data) #Convert string rec_data to float temp print "The Measured Pressure is ", Pressure, " Pa." # Print the result except: pass time.sleep(2) #delay before sending next command print ""
This python code will request Temperature, will then read the response, and then will print the data. It then requests Pressure, reads the response, and then prints it. If you look at our earlier lessons you can see graphical techniques to visually present the data. The hard part is getting the data passed back and forth, which we show how to do in this lesson. Python with Arduino LESSON 13: Calculating Height from Pressure measurements from BMP180 Pressure Sensor. It is time to bring together a lot of things we have learned in our earlier lessons to create a Height-O-Meter, which will plot how high our BMP180 pressure sensor is above the floor. For this lesson we make simplifying assumption of constant temperature. 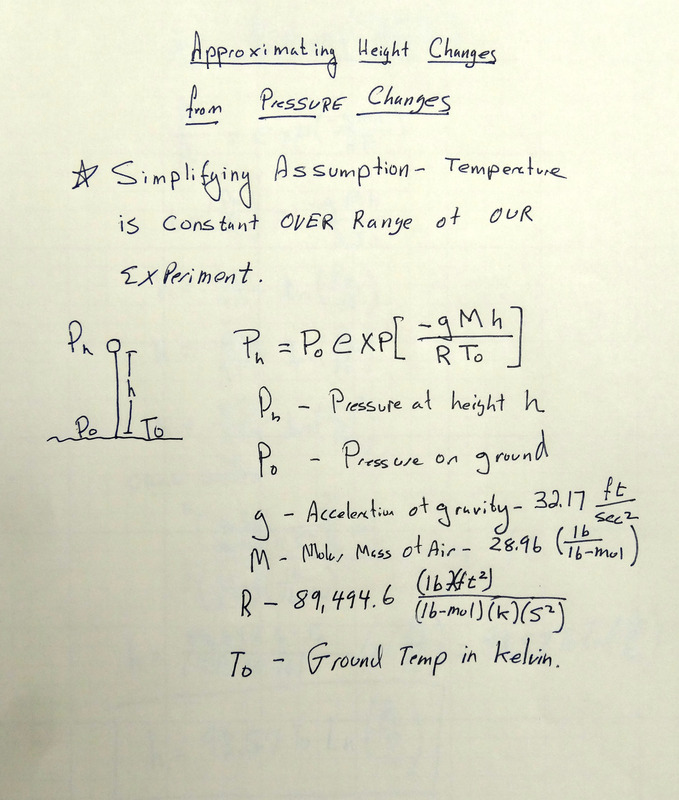 When we use the sensor for our space probe or other high altitude experiments we will need to derive the equation again to take into account changing temperature. We went through the math of calculating height from changing pressure in LESSON 12. 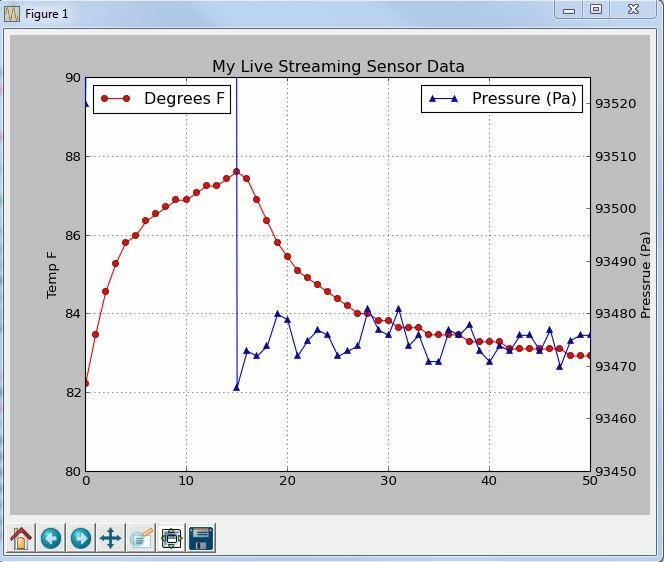 In this lesson, we start with the software we developed in LESSON 11 for measuring, streaming, and plotting pressure and temperature data from the BMP180 sensor. The software we are using on the arduino side is shown below, from LESSON 11. We modify the Python code from LESSON 11 as explained in the video above to get this code for the Python side. print "Calibrating Sensor . . ."
Please go through video for complete description of this software. Remember this is only valid for small changes in height over which temperature is constant. In LESSON 9 we learned how to hook up a BMP180 Pressure Sensor and make pressure and temperature readings. Then in LESSON 11 we learned how to stream that data to Matplotlib and create live graphs and charts of our data that update in real time. We could see that as we moved the pressure sensor up and down, we could see the pressure change, as the pressure decreases with increasing elevation. This leads to the interesting question of whether we can use our circuit developed in LESSON 9 to create a Height-O-Meter . . . a simple device that will measure the height above the floor. 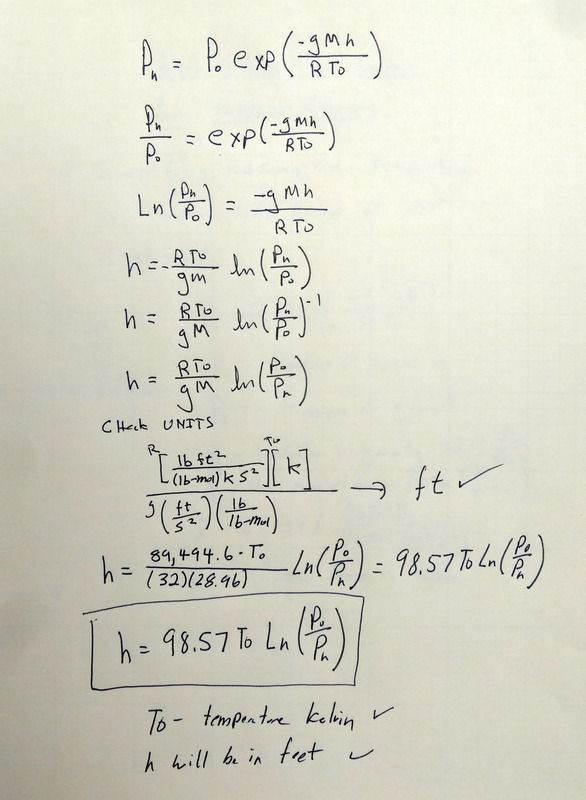 The math to calculate altitude vs. pressure turns out to be very complex. Particularly, if we wanted something for our high altitude balloon flights, or for model rocketry. It turns out that for the case of measuring height inside and for relatively small changes in height we can make simplifying assumptions that make things much easier. The assumption we will make is that temperature does not change much over the range of our experiment. With this assumption, we can create our own Height-O-Meter. To do this though, we do need to to through some math. I show my math below, and go through it step-by-step in the video. Remember, this simplified approach is only valid for playing around with small changes in height. We will have to do the more complicated math when we make our high altitude balloon probe. For now though, this math will work pretty well. We can rearrange the equation to solve for height as a function of pressure. We now have all the pieces put together to allow us to plot live data from the Arduino. If you have kept up with the earlier lessons, you will now have everything you need. If you have not done the earlier lessons, make sure you have python 2.7, vPython and pySerial installed from Python with Arduino LESSON 2. Make sure you have installed matplotlib (Python with Arduino LESSON 7), and install drawnow (Python with Arduino LESSON 10). Also, you need to build the BMP180 circuit and get the arduino programmed up as explained in Python with Arduino LESSON 9. 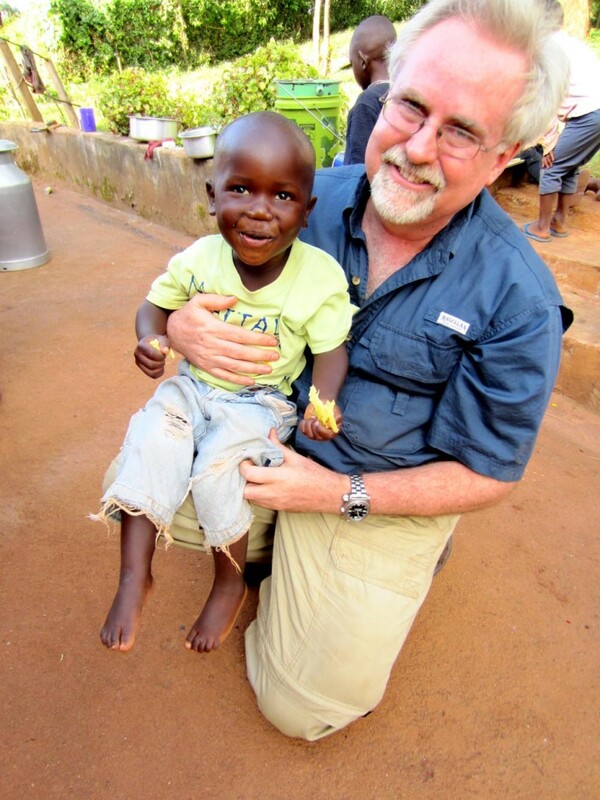 With this business taken care of, you are now ready to start plotting live data. We are using the Adafruit BMP180 pressure sensor. We showed how to hook it up and program it in LESSON 9. As a reminder, we are using this code for the arduino. LESSON 9 explained in detail how the code works. The video in this lesson above explains step-by-step how to develop the code on the Python side, and how matplotlib and drawnow work together to make live graphs and plots of data streaming from the arduino in real time. The code below is what we developed in the video. Do not simply cut and paste this code, but make sure that you understand it so you are able to create your own live graphing programs from scratch. If you are in my class, you will be required to be able to develop live graphing code like this from scratch, so don’t take a shortcut and copy and paste. You should be seeing data like the graph on the top of this lesson. You will probably need to adjust your y-axis scale parameters in Python to ensure the scale is suitable for the data you are taking. If your chart is blank, likely your y-scales are not right for your data measurements.